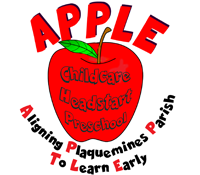 Welcome to the APPLE Early Childhood Network at Plaquemines Parish School Board. We are Aligning Plaquemines Parish to Learn Early! In the past, parents searching for quality education for their young child had to navigate a maze of options. Now, our parish has worked together to create a cohesive system of quality options for our youngest students. Parents can explore the links to the right to get more information about the programs we offer, the eligibility requirements of the programs, and information on enrollment for the programs. Louisiana School Performance Scores and Early Childhood Performance Scores are reported on a new interactive, online tool. Please search the Louisiana School and Center Finder for our schools or centers based on what matters most to you.